As a classroom teacher, I made Writing Workshop a regular part of my schedule – whether I taught grades 3-5 (as I did for three years), or grades 1-2 (as I did for five years). I found that the more time and instruction I gave, the greater the likelihood that my students would love to write. I want so much to foster that same love of writing in my own children. One thing all writers love is words. 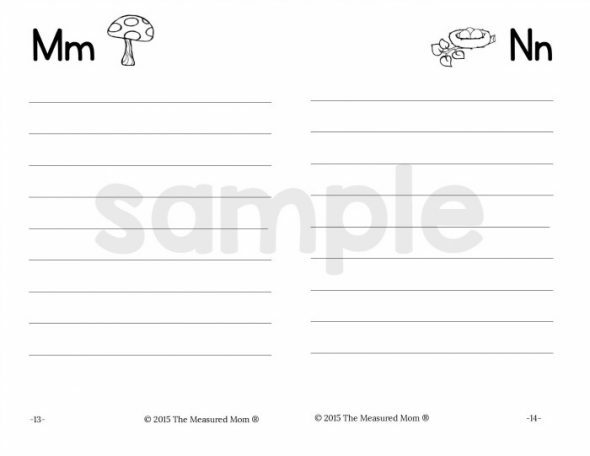 So I created a printable spelling dictionary so my children would have a special place to keep them. (This post was originally published on April 23, 2013). So… do you consider yourself a natural speller? How about your kids? It’s true that the ability to spell comes easily to some kids and not so easily to others. I remember a first grade student who was a natural speller. At her parent teacher conference I asked which of her parents she inherited that gift from. I guess that’s what happens when both of your parents are six feet tall! 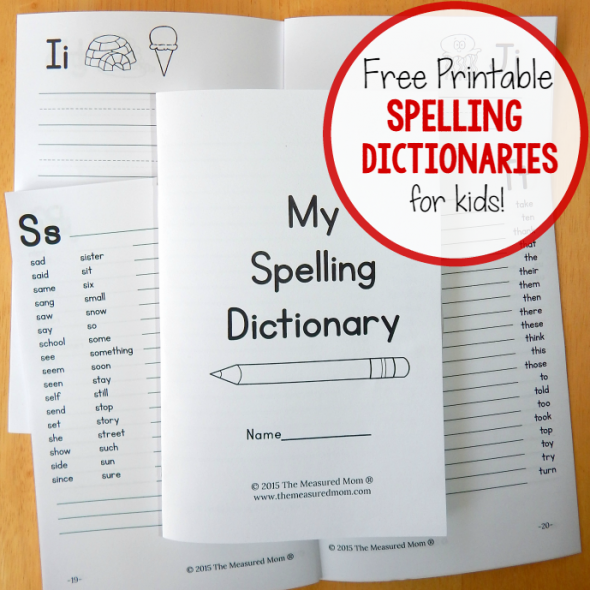 Whether or not your child is a natural speller, these free printable spelling dictionaries are a fabulous resource. Please note: the updated version has different pictures, in black and white. 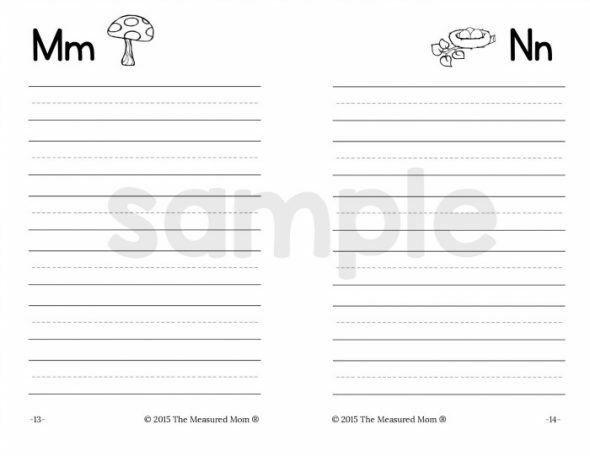 If you are the parent of a preschooler or kindergartner, consider printing a book without the word lists. This way your child can be a word collector – spelling words as he hears them and writing words he already knows (his name, Mom, Dad, etc.). 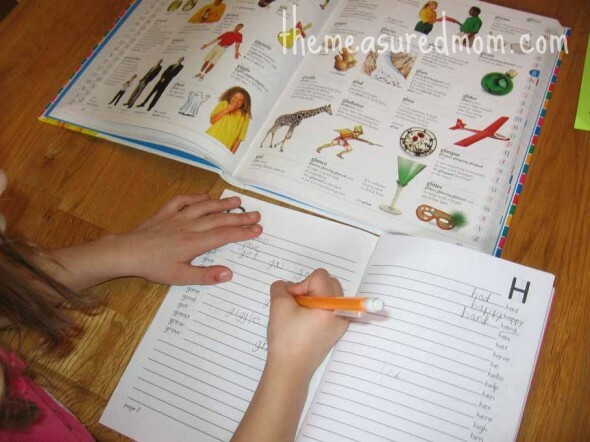 If you choose to print a dictionary with word lists, encourage your child to use it as a reference as he seeks the spellings of words commonly used in writing. Note: The new dictionaries have an updated look. 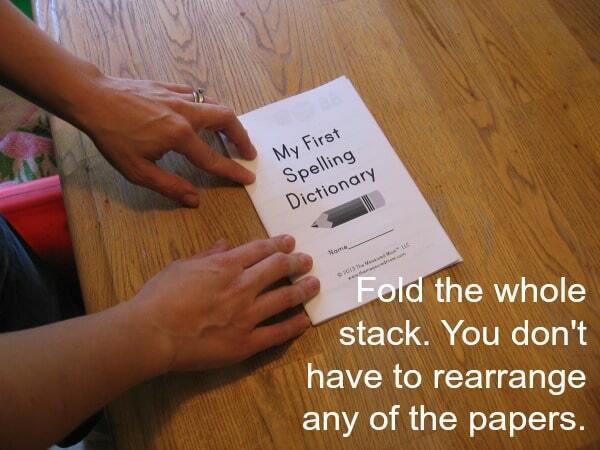 Let your child find his own use for the dictionary. While I was working with my Four, my daughter was busy copying words from the word lists. This was not my intent when I created the dictionary, but who am I to get in the way of child-led spelling practice? When she wondered what to do next, I suggested she get out her new picture dictionary and find words she wanted to record. She was enthusiastic and stayed busy for a while. Please don’t encourage your child to look up every word he wants to write. This will really slow down the creative process and make him dependent on spelling every word correctly before he’s ready to do that. Please encourage your child to “invent” spellings according to her ability. For example, I was thrilled when my Four spelled turtle “TRDL.” Look at how many sounds he puzzled out! He was learning much more about sounds by figuring out his invented spelling than by writing letters by rote as I dictated them, which would merely be handwriting practice. 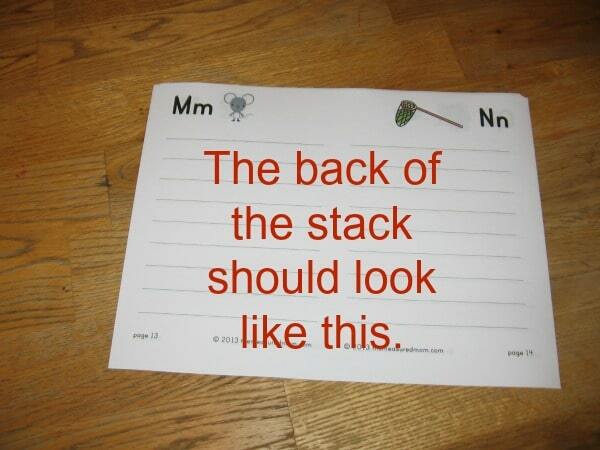 Of course, if your child is truly ready to learn and remember a spelling, by all means supply the correct one. Choose one of six versions! When I first created these dictionaries, my oldest son was showing an increased interest in words. He asked about words in print and wanted to write notes to his sister. I knew it was time to give him a spelling dictionary, too. However, since he was reading very little, I did not want to give him a dictionary with word lists already included. Instead, I wanted him to puzzle out spellings on his own — while having a special place to house words that he uses a lot. That’s why the first two versions have just the letters and a picture clue on each page. I included pictures for the long and short vowel sounds as well as pictures for the hard and soft sounds of C and G.
It has pictures and handwriting lines. It has pictures and wide lines. It has word lists, pictures and narrower handwriting lines. It has word lists, pictures and wide lines. It has word lists, pictures, and narrow lines. It has word lists and narrow lines. Whether you are a classroom teacher, homeschooling parent, or a parent (like me) who seeks to supplement your child’s school education, I hope you will find these dictionaries useful! 1. First, make sure you have Adobe Reader on your computer. It’s free, and you can get it here. 2. Do NOT left click on the “HERE” button to print. 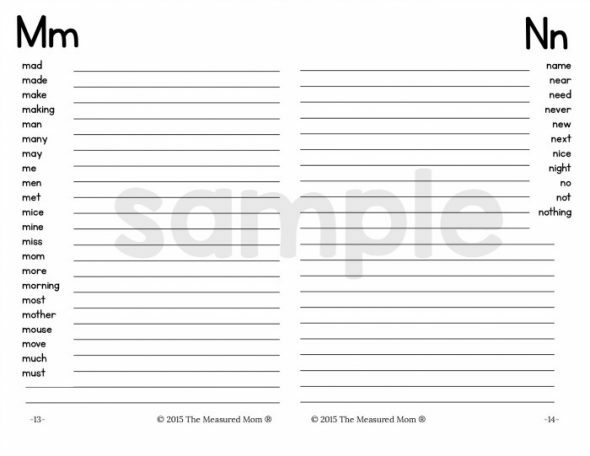 This works for most of my printables, but for this one you can’t find the right option for printing front to back. 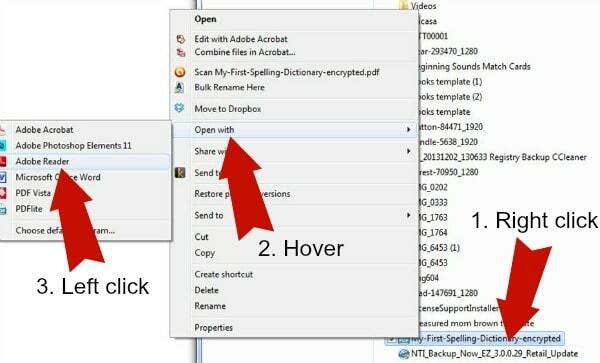 Instead, RIGHT click and “save as” to your computer. Put it in a place you’ll find it. I put things in my downloads folder. You might also save to your desktop. 5. Under print options, print pages 2-15, click “print on both sides” and make sure you “flip on the short edge.” (Otherwise the pages will be upside down on the backs.) When all these are checked, print. I’ll let the pictures do the rest of the talking. Remember that these are the original versions of the dictionaries. The cover and inside pages are slightly different now. Follow The Measured Mom’s board Spelling Made Fun on Pinterest. What a FANTASTIC resource! Thanks for sharing! Thank you, Angela! I hope you can use it! I love the web site. I use everything because I teach kindergarten and grade 1. I found the web site has so much to offer. This is great, I’m so glad I stumbled upon your blog on pinterest. This may be a silly question, but I’m wondering if the Writing Workshop you mentioned is a curriculum you purchased or if it’s something you made up? Writing (not handwriting) is not a strong area for me, at least in teaching it, so I’m looking for some resources I can use. That is such a great question, and I am going to go back into the other post to clarify. First of all, I understand that writing is not a strong area for you because that’s true for most people. That’s why, I think, most people teach writing with just a prompt; they truly don’t know what else to do. 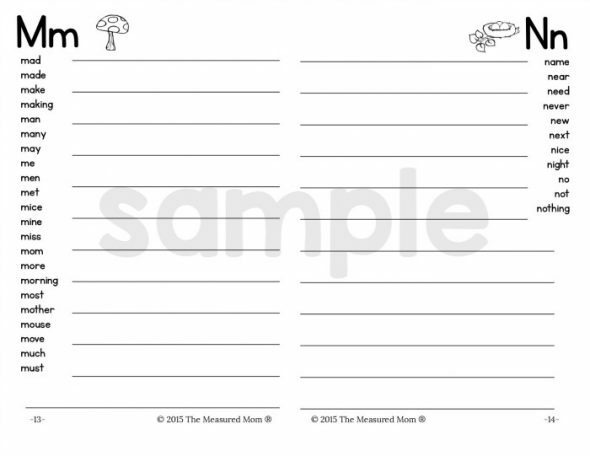 prek: draw a picture and write one letter to label the picture. Kindergarten: how to stretch out a word and write the sounds you hear. b) Give the kids lots of time to write. On any given day they may be: coming up with a new idea, writing about that idea, revising their work (changing it to make it better), editing their work (fixing spelling and grammar), or publishing their work (rewriting it or typing up their final copy). c) While kids are writing, you step in to “conference” – talk to them about what they’re doing and give assistance. In a classroom, a teacher walks around the room, keeping track of whom she’s talked with and taking notes about what to check for the next time she meets with those students. A homeschooling parent would offer encouragement and suggestions, but would not hover. d) Kids would share what they’ve written — in a classroom, just a few kids would share, or kids would share with buddies. At home the child could save his work to share with Daddy or a sibling. Can I ask if you are a classroom teacher or a homeschooling parent? Hello, again, Stephanie! I was thinking of you recently when I dug through my files and found a presentation I gave on Writer’s Workshop at a teacher’s conference some years ago. 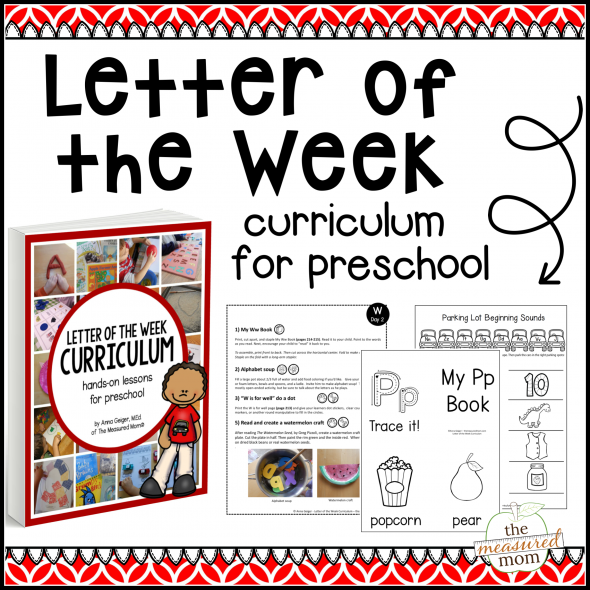 It is written for classroom teachers but is easily adaptable to home instruction. I can e-mail you the document if you’d like. If you’re interested, just reply to this comment with your e-mail address or send me a message at themeasuredmom@gmail.com. Hope to hear from you! As a classroom teacher, I loved Writer’s Workshop. Even the most reluctant writer wanted to share something. When I came home to teach my children, I let go of it as one of those things that was a “classroom” strategy, so I am very intrigued how you make it work, especially the management of their work and the different grade levels. My kids are 8, 5, 3 and 1. I’m trying to wrap my brain about so much. What I am saying is I would probably really love a class. Thank you for spelling dictionary!! See the Reading/Writing Connection by Regue Routman. She is a writing guru! I love Regie Routman’s books too! “Writing Essentials” and “Reading Essentials” are two of my favorites. Thanks for this -we used to have these when I was at school. Great resource! I love it! Pinned! I showed my daughter and she’s very excited about this. We have a little spelling reference book that was her brothers that she has at school that she uses quite a bit. She has wanted one for home and I think this is perfect. I love that it has room to add words. I am sure it will be filled by summer’s end! I’m sorry your comment slipped by me, Diana. I’m so glad you can use this! 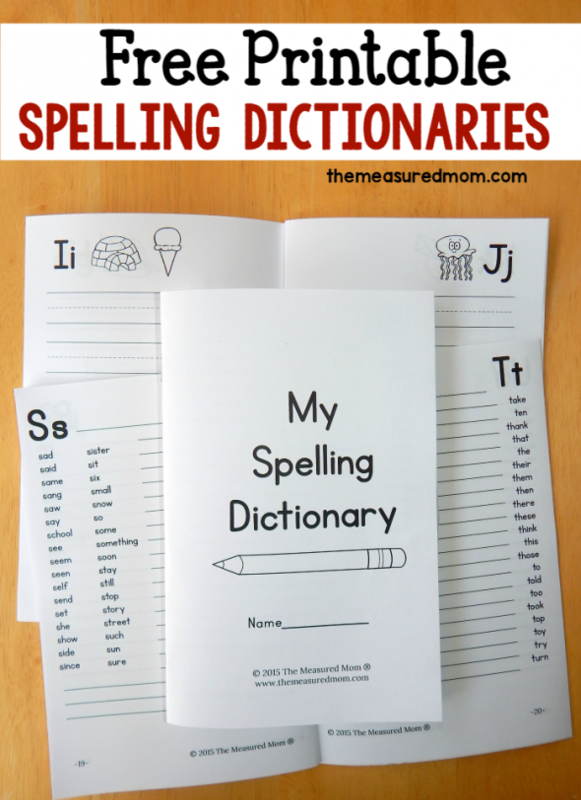 Love this idea of the spelling dictionary! I have pinned this onto my Language Arts board. Thank you for linking up this week to our Hearts for Home Blog Hop! Thanks so much for the pin, Jill! These are fantastic, thank you so much for sharing! This is fantastic! Thanks so much for sharing on We Made That! I will adapt them to use the dictionary resources in German 🙂 Here children don’t go to school before they are 6 or 7 years old. Most of the kids haven’t learned how to read or write before school and I am not sure it might make primary school experience better or boring if they know how to do it. We have great schools too and teachers, but they often aren’t prepared to deal with “clever” children or those who wanted to learn things earlier and did so. Differentiating (?) tasks.. no clue how its called in English … I mean tasks that are so to say customized for the individual kids are still not used enough. Anyway, my four-year old loves to copy letters, I will just try and see how she likes doing it in a more structured and guided way. Thanks so much!! Hi Conny — I’m sorry it took me so long to get back to you. In your comment you talked about differentiating instruction (that’s what we call it here) in Germany – that teachers aren’t often prepared to do it. It’s definitely something we learn here as we study to be teachers, but in practice I’d say not many teachers actually do it. It’s much easier to have everyone do the same thing. When I taught I varied instruction for my students, but I had a hard time convincing my co-workers to give it a try. As for teaching kids too much before school so that they are bored… I’ve heard that before, but in my experience it doesn’t hold. My daughter was reading fluently before kindergarten – she has a great teacher, but she doesn’t differentiate instruction – and she loves school. When I taught the really bright kids (who also were well behaved) I was able to challenge them and they read in their spare time or did their own projects. Anyway — hope your 4 year old can use the dictionary! Thank you so much for sharing this excellent resource! You’re so welcome, Erin – thanks for linking to my guest post at This Reading Mama and to the dictionary! 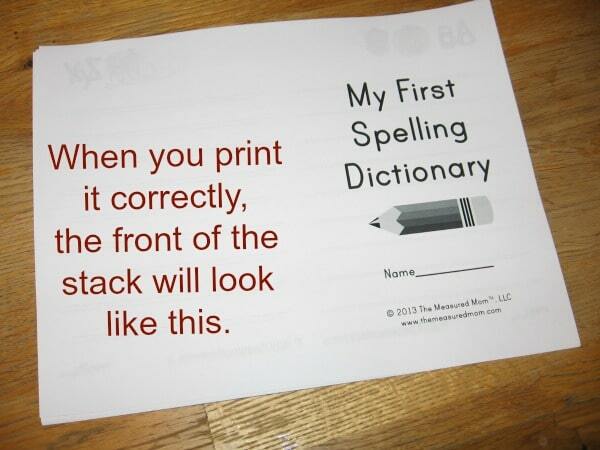 I’m sorry cannot download My first spelling dictionary for pre K kids, how can I get it please? Wow! Thank you so much for sharing! Can’t wait to use this with my first grader who loves to write! So glad you can use it, Beth! Diane, I’m so sorry to hear that. 🙁 I haven’t heard from anyone else with the same problem. I’m afraid I’m not a techie by any means – but maybe we can figure something out?? Send me an e-mail at annageig@gmail.com with specifics about what’s not printing for you. I’m glad you can use it! Thanks so much for stopping by! I did send you a message via the contact form on your blog. But you can reach me at themeasuredmom@gmail.com if you still need to contact me – thanks! So glad you can use it! Thanks so much for checking it out, Elizabeth! Thank you so much for this wonderful resource! I’m sure my children will benefit from your spelling dictionaries. THANK YOU! You’re very welcome, Aimee! Have fun with them! Wow! Thanks for sharing this resource. I have been looking for something like this for awhile. I have a fourth grader, so some of the words are a little easy, but he has plenty of space to write in his own words. Yes, I used words from a list of “most commonly used words” in children’s writing. So I debated whether to keep some of those simple ones in there but in the end used them all. I’m glad you can use it, Tabitha! OK, I’m not sure how to print this. I have an old printer and so I have to do everything manually meaning I print a page and then have to take it out and put it back in to print double sided. So is the title page part of the book or do I start printing double sided with the letter page? Are page 3/4 back and to back and 5/6 back to back. Like that? I am really confused! Sorry! Thanks, Anna! I got it now. Can’t wait to use this. Your site has been so helpful to me and you are quick to answer questions. I appreciate that. I’m so glad it worked for you, Shonda! Can you please tell me which picture dictionary you have in the last photo? Is it Scholastic? Thank you. We gave it to my daughter as part of her 6th birthday (she’s big into words!). She’s learned so much from it. Thank you for letting me know. It looks perfect for my kids. Thank you so much. This will be very helpful for my soon to be 4-year-old. So glad you can use it, Rae! marketplace must just as before adapt and respond. Thanks, these are exactly what I wanted for my 1st/2nd special ed. students. I’m glad you can use them, Tammy! Thank you!! You saved me hours of creating my own dictionary. I teach 3rd grade and LOVE this!! I’m so glad, Kristina! Have you printed and assembled it yet? A reader was having trouble even with the tutorial, so I hope it’s easy to put together! Thanks so much, Ashley – your comment made my day. 🙂 I love making this sort of thing, and the time is worth it when lots of people can benefit. So glad you can use it! I’m so glad you can use it, Hilary! Thank you. This will be so helpful. You’re very welcome, Tony – enjoy! Thank you ~ This is exactly what our 7 year old granddaughter needed to take her writing and reading to the next level. I’m so glad you can use the spelling dictionary, Peggy! Thanks so much for your comment. Thanks for this great resource! A regular dictionary, even a child’s dictionary, is too much for my son right now, so maybe this will give him a resource that is right at his level. Thank you so much for making these dictionaries! They are a great resource! Is it possible for me to switch the the clipart around so that I may use these dictionaries to help my nephew and niece study Spanish? Through a program like Photoshop or MS Word? Both spelling books are very nice. In the My First Spelling Book, the lines are very large and not divided. For the very young age that is learning to place side of hand on paper and only move fingers, ½ inch or about 12 mm is a good line height. Adding a colored red dotted dash and a blue top line and green bottom line, may make the writing of letters more understandable and more inviting. 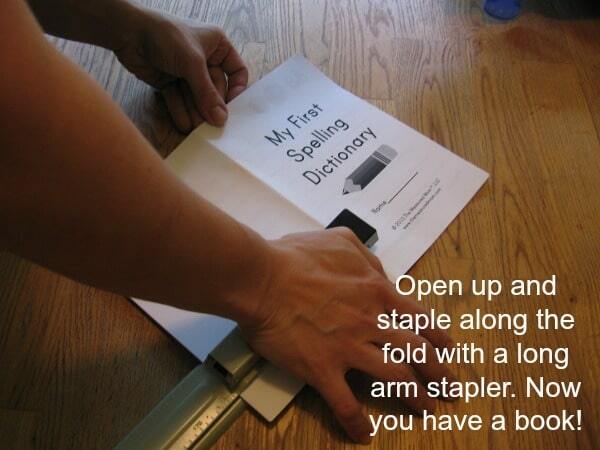 This will hopefully help in making the short letters and tall letters easier to make. 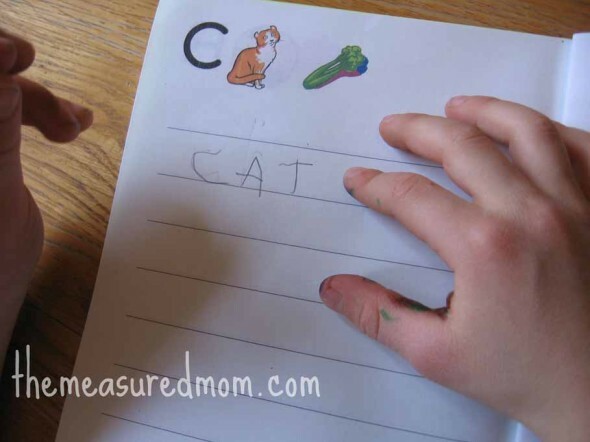 Then spacing these colored lines a ¼ inch apart will help the child understand letters with tails. Kids of ALL ages love color. In the example words, by making the vowels or vowel teams a color may help a child remember the most difficult part of English spelling, which grapheme to match up with a vowel sound (phoneme) whether this is a diphthong vowel sound or a monophthong vowel sound. Also adding a few simple examples in the CVC pattern would by nice in the My First Spelling Book. Many other ways could be used to pop the difficult to spell parts of English words. But this may clutter your cute little books. Again, I love the little books. Thanks for your suggestions! This is by far the most time consuming of all my printables, taking tens of hours to make and put together… so I am not looking at updating it in the near future. But I will certainly keep your suggestions in mind! Thank you, Henry! Can you explain more what you mean about the error with letter P/Z? I couldn’t find that one. Is that in Dictionary 1? I printed the book. My first page is the cover…next page is a/z…next is y/b. 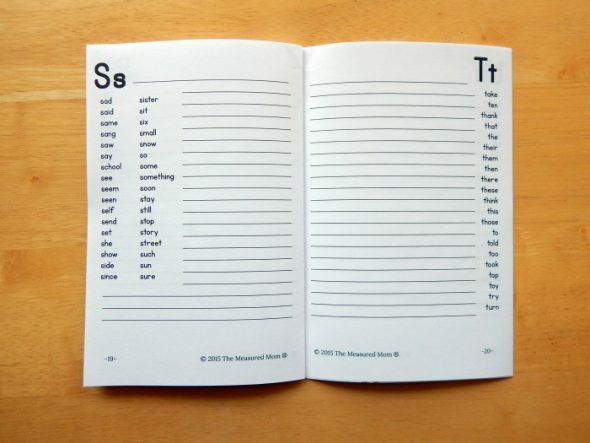 If I follow the directions and fold the book, it reads: z, b, x, d.
How can I arrange the pages so they read alphabetically? It should work perfectly if you follow the picture tutorial, Lauren. Was there something that was unclear? I have tried several times to print this but its not working. Plus the pages don’t match on your site S and T are 19 and 20 when I printed them they were S 19 and H 8. Could you help me Thank you so much! Hi Sue! Can you explain the problem that you’re having? When you say you try to print but “it’s not working”? 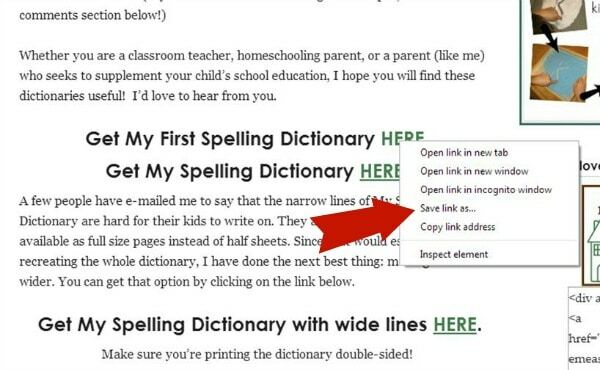 Thanks so much for making the dictionaries a free resource! I love anything free for teachers! I hope my first graders will get good use out of their dictionaries! I have downloaded many of your free resources and can only thank you for sharing so much that has clearly taken you so long to prepare. The children in my class benefit immensly from your generosity. Thank you so much. Thank you so much for your kind comment, Louise! I’m so thankful you and your students are enjoying my materials! Do you have any helpful hints for printing from a Mac? Having trouble getting everything to print properly. I’m sorry that I don’t; I’ve never used one. 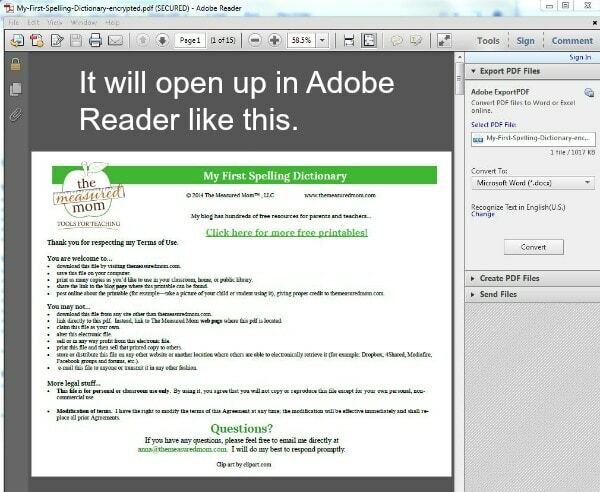 Are you opening and printing from Adobe Reader? I have Adobe on both my school (PC) and home (MAC) computers. I have an option to print back to back, but I don’t have an option for “flip on the short edge”. And thank you, by the way, for creating this little dictionary. 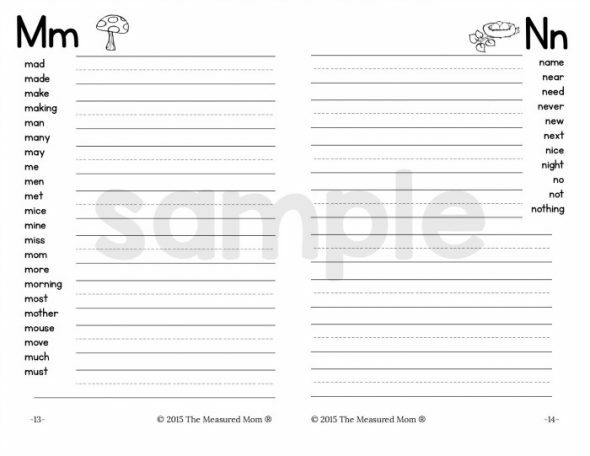 It will be extremely helpful for my 3rd graders to have in their writing folders throughout the year. Actually I did send it to the panthervalley address. Did you check your spam folder? I’m so glad to hear that, Ali! I hope you don’t mind I used one of your dictionaries to explain how I teach with a dictionary in my classroom. I did give you credit at the end of my post as well as provide a link back to your blog. You did a great job, Sue – thank you for sharing my spelling dictionaries! I’m sorry – I don’t know how to help you unless I have more information. What about the tutorial is confusing to you? Me too. My printer doesn’t have an end to end choice. Would it be another name? It might say “front to back” or “2-sided.” The key is to make sure they are printing so that you flip on the short side. 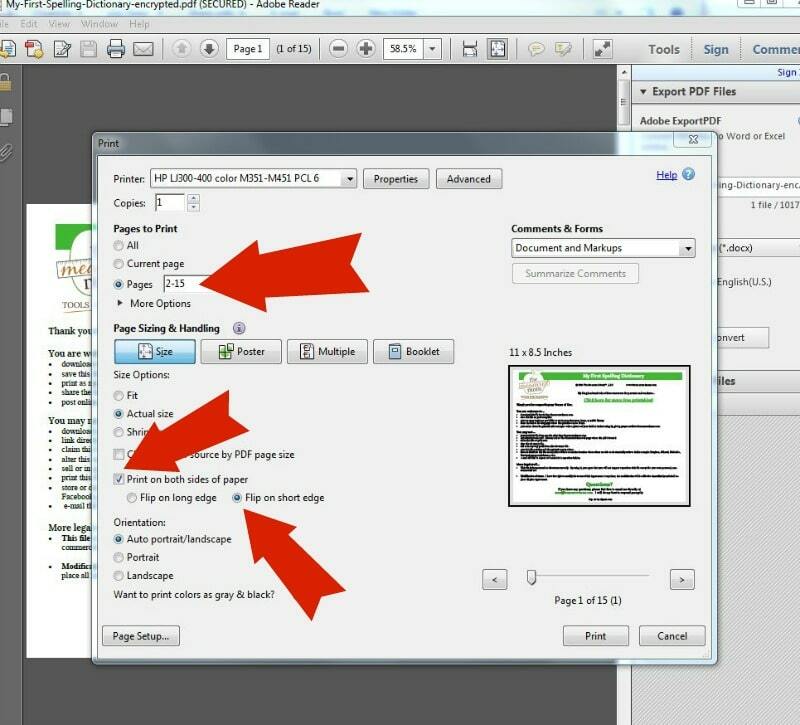 This setting will look different depending on your printer, but if you open and print with Adobe Reader you should find that option. Thanks so much! This is exactly what I was looking for for my 1st grader! Yay – I’m so glad you can use this, Kate! Am I dreaming or did the dictionaries have number/days of the week pages before? This is awesome. Thank you so much for this. Hi, I was just wondering if I am missing where the link is for the rest of the dictionary (if there is one) for the letters after N. Thanks! HI Chris – I believe that all the letters are in there. But they’re mixed up because it’s set up to print like a book. Let me know if you don’t see all the letters after a second look! I am having the same trouble. It only shows A-N in version 3. Can you please link the entire file for me? I see it now. Thank you! Thank you so much! It’s wonderful to have all of these different versions, to aid with differentiation while having a consistent appearance across the class. These are wonderful. You’re very welcome, Karen! I’m glad you like them. Any thoughts or other programs I can print from? Thank you! Hi Lisa! I’ll send you an email with a screenshot. I LOVE the differentiated spelling dictionaries. Thanks so much for sharing! Thanks for your generous and creative resources, this is very helpful! Thank you so much for sharing. I will soon be teaching a creative writing class to 3rd to 6th graders. (It’s a Co-Op homeschool group.) This will help so much with helping the students become independent writers. Love this! I am trying to print for my new class but am having trouble. There is not option on any of the printers I’ve tried to print both sides or flip the short edge. At home I’m using a Mac and at school PC. Any tips? Thank you so much! I don’t have a long stapler at work. Do you have any ideas on how to assemble this without a long stapler? You could just staple 3 staples along the left side. It wouldn’t work as well, though, and might cut off some text. My Daughter is a great reader yet struggling so much with Spelling . 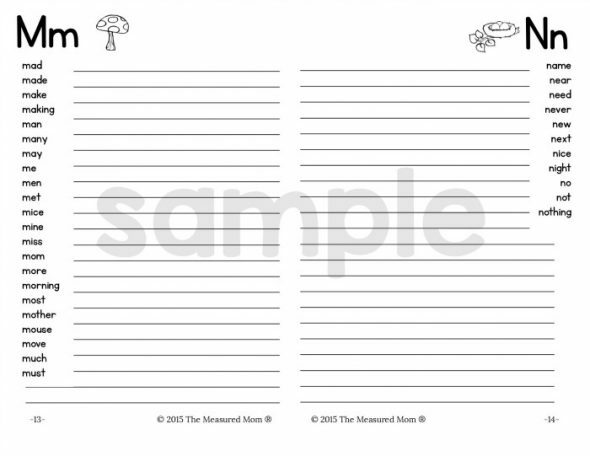 thank you for making this resource, and making it free, I am printing today! !